If you’re wondering about reconstructing your driveway with asphalt, take a second to reconsider. While a reconstruction is necessary in some situations, an asphalt overlay (also known as resurfacing) is often a better solution. An asphalt overlay is when the top layer is removed and replaced with a fresh layer over an existing foundation. Read on to find out about the benefits of this alternative solution. One of the most compelling reasons to carry out an asphalt overlay vs a full reconstruction is because it’s often cheaper. An overlay requires less materials and less work, meaning it is usually significant cheaper. Our experts will be happy to inform you of which methods are the most cost-effective. We know your business is focused on the bottom line, so we make that our number one priority. When performing a full reconstruction, undercuts are usually necessary. However, unless you’re entirely aware of anything under the pavement, there is always the danger that you will cut into something unintentionally. This can add extra stress and time to the operation. With resurfacing, this is never an issue. Another reason why overlays are a solid alternative is because they are always quicker than full reconstruction. While reconstruction may take weeks, an overlay can be completed within a matter of days. For business owners, this translates into less hassle and less headaches. We want to keep your business running as smoothly as possible, meaning we’ll repair the lot as quickly as possible. Of course, there are certain situations where a full reconstruction is necessary. An overlay is only as solid as it’s foundation. However, in a lot of cases, the base layer does not need to be replaced. In these situations, it just makes sense to do an overlay. Why drive up costs unnecessarily? 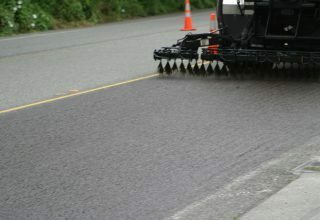 5- On some occasions, an asphalt overlay can even be performed over cracks. Many times, the cracks in a base layer require it to be fully reconstructed. However, there are even times where these can be repaired for a resurfacing. Don’t assume your lot needs to be fully reconstructed– an overlay may still be the best solution. To keep operation costs down, an overlay can be a great option for business owners. With a dedication to excellence and customer satisfaction, you can rest assured that our professionals have what it takes to handle your asphalt lot. Our team combines over 30 years of experience, meaning we’ll do whatever it takes to get the job done right.